This type of pile may be driven through soft or hard soil. A steel tube having an internal diameter equal to the diameter of the pile and 20 mm in thickness, is driven into the ground. To facilitate driving of the pile, the steel tube is fitted with a detachable steel shoe that completely closes the bottom of the tube. 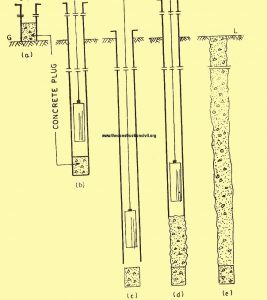 When the tube has been driven to the required depth, a charge of concrete is poured into the tube and the tube is gradually withdrawn leaving the charge of concrete below. Thus by alternately pouring the concrete and withdrawing the tube, the pile is constructed to its full length. The metallic shoe remains in place and hence a new one is needed for each pile In case the pile is required to be reinforced, the reinforcement cage is lowered into the steel tube prior to the pouring of concrete. This type of pile has an enlarged base and a corrugated stem. 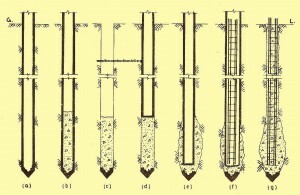 A steel tube, having its internal diameter equal to the diameter of the pile required, is held vertical at the ground level with the help of leads. A charge of concrete is poured at its base filling the bottom 60 cm to 90 cm of the tube. The charge of concrete is consolidated into a solid plug by the blows of the drop hammer working inside the tube. Further blows of the hammer on the plug pull the tube down on account of the friction developed between the concrete and the inside surface of the tube. When the tube has been driven to the required depth, it is slightly raised’ and the plug is forced out of the tube by hammering. The reinforcement cage (if needed) is then lowered inside the tube. 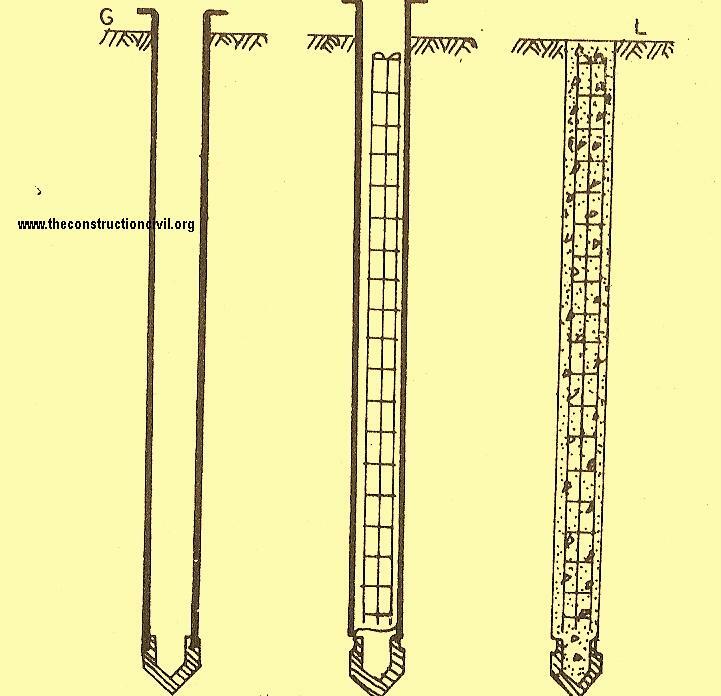 A fresh charge of concrete is then poured in the tube and rammed well by the drop hammer while the tube is pulled up a short distance. The repeated process produces a series of corrugations on the stem of the pile and the pile is thus completed. This type of pile is best suited for places where the ground is soft and offers little frictional resistance to the flow of concrete. A steel tube fitted with a cast iron shoe is first driven to the required depth. There is a water-tight joint between the shoe and the casing so that even if the pile is to be driven in water-logged ground, the soil and the sub-soil water cannot find an access in the tube before the concreting is done. The reinforcement cage (if needed) is lowered in the tube at this stage. The charge of concrete is then poured in the tube. The extraction of the tube and the ramming of concrete is effected by the upward and the downward blows of the hammer. The tube is connected to the hammer by extracting links. During the upward blow of hammer the tube is raised up by a short distance and the concrete moves down to fill the space left by the tube. During the downward blow, the concrete is compacted and rammed outwards thereby forming corrugated surface for the pile. This results in increased friction between the pile surface and the surrounding ground. In situations where it is desired to have increased frictional resistance between the pile stem and the surrounding ground, the surface of a vibro-pile is expanded greatly to achieve the object. this increases the bearing resistance of a vibro pile. 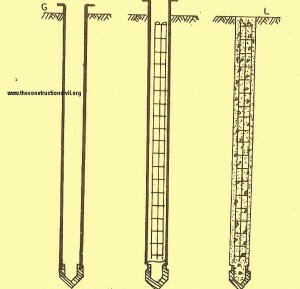 In this process, a steel tube- of the required diameter of the pile having a detachable cast iron conical shoe at its base, is driven to the required depth. 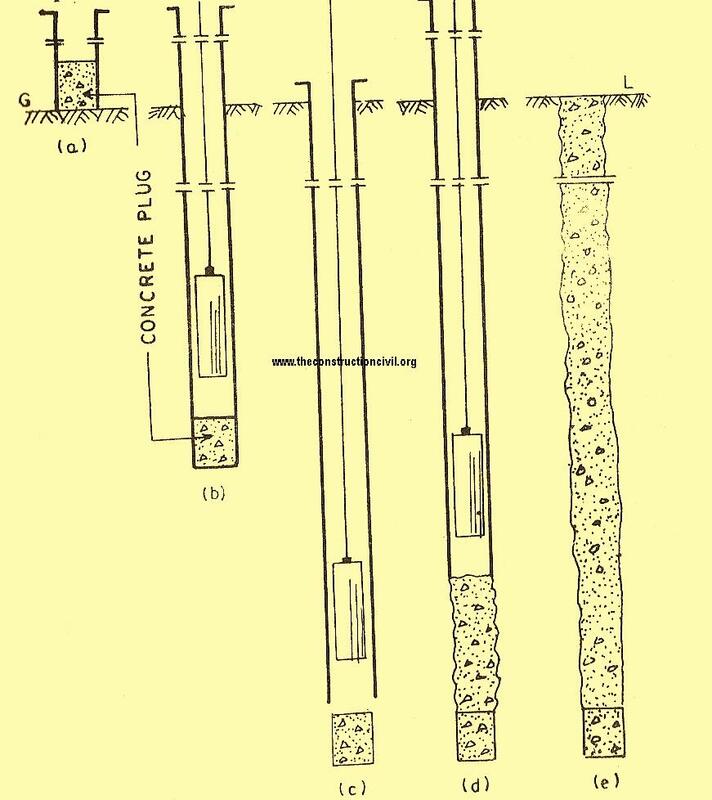 A charge of concrete (tilling a good length of tube) is poured and the tube is completely withdrawn leaving the cast iron shoe and the charge of concrete down in the pile hole. The withdrawn tube is fitted with a special flat iron shoe and once again driven in the same hole. The charge of concrete down below gets expanded to nearly double its area by this process. If required, another charge of concrete is poured and the process repeated. The reinforcement cage is there after lowered in the tube (if needed) and the pile is completed as usual. This type of pile is constructed in lengths varying from 6 to 12 m. The diameter of the pile varies from 40 to 60 cm at lop and the diameter at its base is slightly smaller, varying from 20 to 28 cm so as to give a uniform taper to the pile. The thickness of the outer shell depends upon the pile diameter and site conditions. The thin steel shell is reinforced with hard drawn wire spiral spaced at 8 cm centre to centre. The shell is closed at the bottom with a steel boot. The shell is placed over ii collapsible mandrel having the same taper as the pile and 1)0th arc driven to the desired depth. 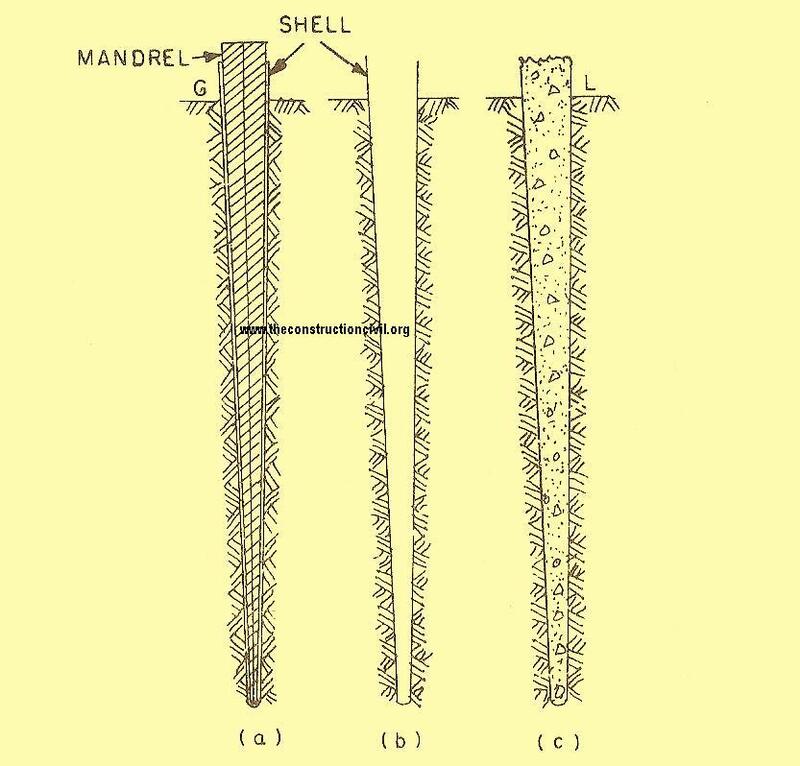 The mandrel is then withdrawn leaving the shell in the ground. The shell is gradually filled with concrete up to the lop. This forms a Raymond pile. 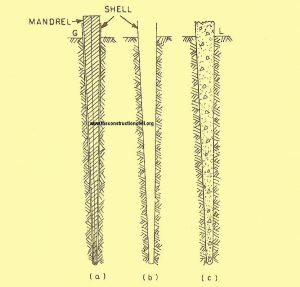 The function of shell outside the concrete core is to prevent the adjoining soil and the sub-soil water coming iii contact with fresh concrete. 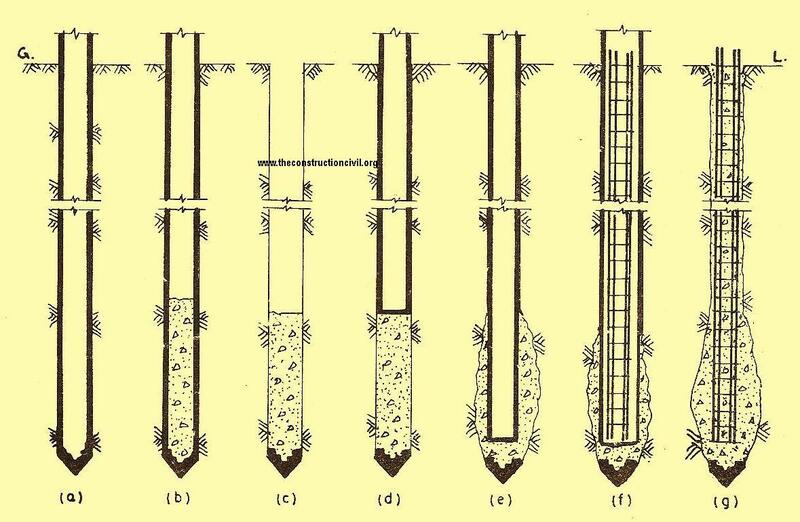 In this type of pile the apparatus consists of an outer casting (a hollow steel pipe ) and an inner core. The bottom of the core is of such a size that it completely closes the open base thickness with two point pick-up. Piles 500 mm square and smaller are usually cast solid, whereas pile above 500 mm square may be cast with 200 mm to 300 mm diameter cored hole (void).